Opal is such a beautiful stone! Love all the shimmer here! ich liebe Opale und finde Dein Moodboard wie immer ganz bezaubernd und inspirierend. 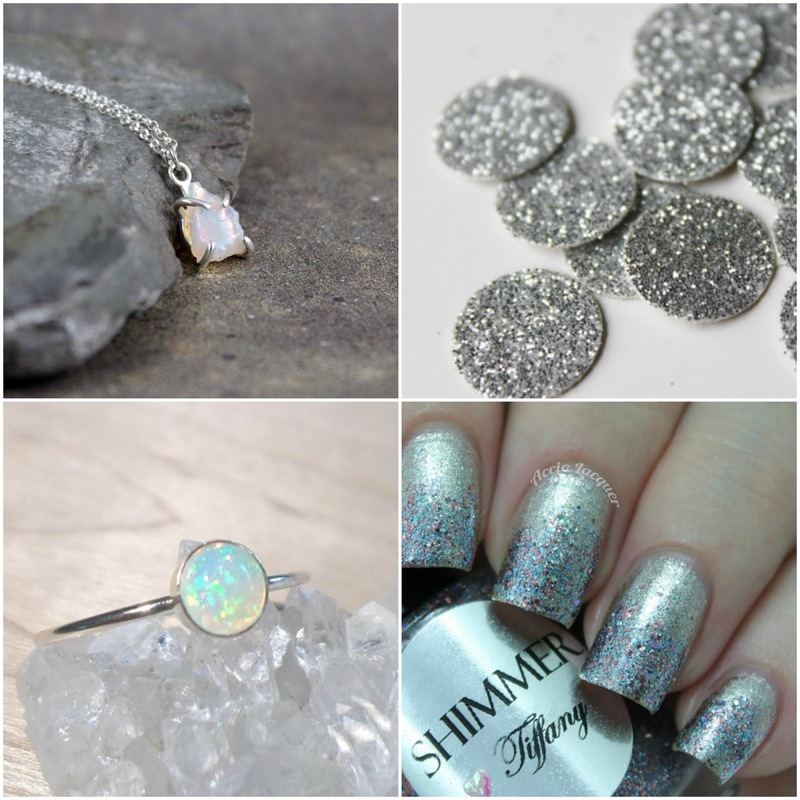 Lovely choice of October birthstone here! You did a very lovely job on picks! I hope you are having a sweet and sparkly Monday! Oooooh, those sparkly silver discs! I've been using similar glitter tape to decorate clothes pins for my upcoming craft shows. :-) There's no such thing as too much glitter. Opal is so gorgeous! The glitter garland is so neat. The ring is stunning. It is so simple yet the reflection adds such nice color. den Opal sieht man heute im Schmuck nur noch selten. Ich mag ihn, weil er so viele Farben hat und jeder Stein optisch schon ein Unikat ist. Deine Collage hat für mich heute auch irgendwie etwas mit Weihnachten und Silvester zu tun. Your mood boards are always so pretty! I love the shimmers today! Wow - two years of making moodboards. No wonder your picks are always so nice and go together well! I love opals. :) That ring!!! I love the ring! And my college age granddaughter would love that glittery nail polish. Gorgeous and glittery! I love opal. LOVE the nail polish :) T.